14 • May 2018 • S I G N & D I G I T A L G R A P H I C S MagnaColours Launches Initiative for Screen Printers UK-based Magna Colours, a manufacturer of water-based inks, announces a new initiative titled "Make the Switch," aimed at screen printers. The program is designed to help shops transition from plastisol to water-based inks. The new initiative uses a 10-step process which features an equipment audit, an invitation to the com- pany's headquarters, and testing. MagnaColours also provides ongoing, hands-on guidance. The organization says with the program, it hopes to "remove the perceived complexity" of transitioning from plastisol to water-based inks. The initiative comes as the latest component in the company's efforts to educate printers on the benefits of water-based printing. In 2017, MagnaColours announced the launch of MagnaAcademy, an ongoing training series focused on screen-printing inks. 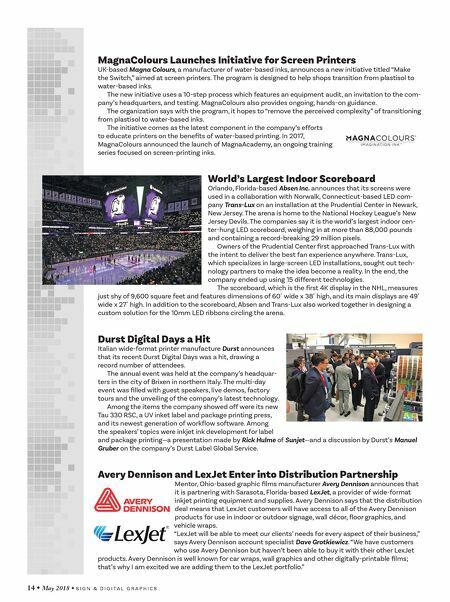 World's Largest Indoor Scoreboard Orlando, Florida-based Absen Inc. announces that its screens were used in a collaboration with Norwalk, Connecticut-based LED com- pany Trans-Lux on an installation at the Prudential Center in Newark, New Jersey. The arena is home to the National Hockey League's New Jersey Devils. The companies say it is the world's largest indoor cen- ter-hung LED scoreboard, weighing in at more than 88,000 pounds and containing a record-breaking 29 million pixels. Owners of the Prudential Center first approached Trans-Lux with the intent to deliver the best fan experience anywhere. Trans-Lux, which specializes in large-screen LED installations, sought out tech- nology partners to make the idea become a reality. In the end, the company ended up using 15 different technologies. The scoreboard, which is the first 4K display in the NHL, measures just shy of 9,600 square feet and features dimensions of 60´ wide x 38´ high, and its main displays are 49´ wide x 27´ high. In addition to the scoreboard, Absen and Trans-Lux also worked together in designing a custom solution for the 10mm LED ribbons circling the arena. Durst Digital Days a Hit Italian wide-format printer manufacture Durst announces that its recent Durst Digital Days was a hit, drawing a record number of attendees. The annual event was held at the company's headquar- ters in the city of Brixen in northern Italy. The multi-day event was filled with guest speakers, live demos, factory tours and the unveiling of the company's latest technology. 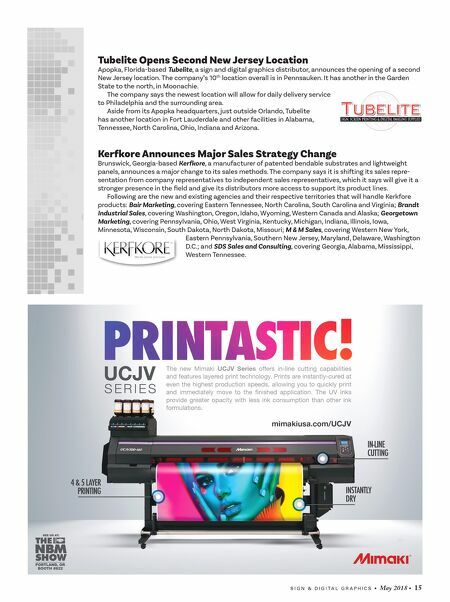 Among the items the company showed off were its new Tau 330 RSC, a UV inket label and package printing press, and its newest generation of workflow software. Among the speakers' topics were inkjet ink development for label and package printing—a presentation made by Rick Hulme of Sunjet—and a discussion by Durst's Manuel Gruber on the company's Durst Label Global Service. Avery Dennison and LexJet Enter into Distribution Partnership Mentor, Ohio-based graphic films manufacturer Avery Dennison announces that it is partnering with Sarasota, Florida-based LexJet, a provider of wide-format inkjet printing equipment and supplies. Avery Dennison says that the distribution deal means that LexJet customers will have access to all of the Avery Dennison products for use in indoor or outdoor signage, wall décor, floor graphics, and vehicle wraps. "LexJet will be able to meet our clients' needs for every aspect of their business," says Avery Dennison account specialist Dave Grotkiewicz. "We have customers who use Avery Dennison but haven't been able to buy it with their other LexJet products. Avery Dennison is well known for car wraps, wall graphics and other digitally-printable films; that's why I am excited we are adding them to the LexJet portfolio."